Reverse Engineer Parts: whether parts are hard to find, obsolete or expensive — we can create parts to O.E.M. specifications for any steam turbine. Steam Turbine Buckets and Blades for any Turbine. We can source and supply steam turbines. Compressor Seals: J Strip and Turbine. Gas Turbine Parts for GE, Allison, Ruston and Garret. 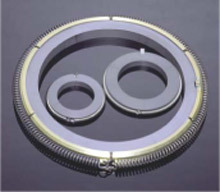 Steampath maintains an extensive inventory of the most popular packing ring styles. Over the years, we have compiled a comprehensive database of 20,000 steam turbine model numbers and part numbers. If you can supply either number, we can quickly determine the correct part number and respond with a quote or ship the part immediatly if it is in stock. Nonstandard and obsolete parts can be manufactured and deleivered in ten working days for routine orders. For emergencies, many special orders can be shipped in a day or less. Gimpel Trip Throttle Valves: repaired and new.